We’ve all been told that you never get a second chance to make a first impression, but what actually goes into that impression? Research has shown us time and time again that appearance is everything—this goes for whether you’re meeting someone for the first time or patronizing a business. 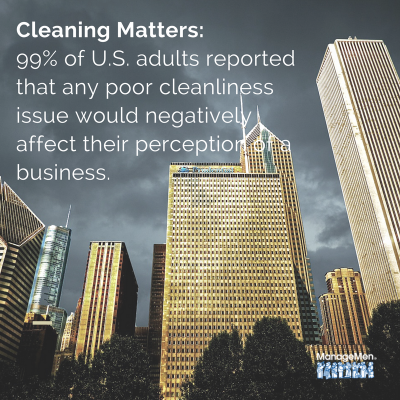 In fact, one study found that 99 percent of U.S. adults would find poor cleanliness would negatively impact their perception of a retail store. When it comes to captivating they loyalty of that ever-elusive generation of millennials, another recent survey conducted by the Health Industry Distributors Association found that appearance really matters, at least when it comes to how they choose healthcare providers. Appearance matters, but as we all know, its importance can often underestimated when budgets are reduced; custodial operations are often one the first cuts that happen. When labor and cleaning frequencies are reduced, dirt increases—and there’s a good chance your customers and prospective customers are taking note. Entryways: Entryways are one of the first areas a customer sees when they arrive at your building, so this is a critical area to maintain. Floors, doorways, glass, light fixtures and all area leading into the building should be kept free of debris and trash. Using a grabber device, dust pan and or broom, remove all trash that appears in entryway areas throughout the day to make sure your facility shines and leaves a positive first impression with guests. Glass and Doorways: Glass doors and windows around the exterior of a building quickly shows soil from fingerprints and dirt and leave the impression that the building is unattended when not cleaned on a regular basis. Spray and wipe these surfaces frequently with the appropriate window cleaner on a daily basis, and more often if there is high traffic. Floors: Protect floors inside the building by using entryway mats both inside and outside the front door. These mats are designed to withhold dirt and allergens, but they also need to be regularly vacuumed and maintained to work effectively. Inside the building, keeping floors clean requires regular dirt and soil removal by vacuuming carpets. For cleaning hard floors, use a dust mop then damp/wet mop and auto scrubber, depending on the condition of the floor. Furniture: Restore the luster to hard wood surfaces on furniture by using furniture polish and a clean microfiber cloth. Also be sure to clean upholstery on a regular basis to reduce soil buildup and spot clean as necessary. Furniture can easily move throughout the course of a day and should be moved during cleaning, so be sure to move them back to their original location. Trash cans: Regularly empty overflowing trash cans and spray and wipe the interior with a cleaning solution to eliminate odors and keep cans smelling fresh. Vents, Blinds and Baseboards: A good rule of thumb when cleaning hard surfaces in a building is to start high and move downward. Use a microfiber cloth or duster to clean hard-to-reach areas like vents and work downward to lower areas to remove dust and keep surfaces spotless. Secure cleaning products and equipment in a storage area near the entryway of the facility so they are always available. Make sure cleaning carts are always well-stocked with products, cleaning cloths, gloves and any other materials required to complete the task. And most importantly, establish a standardized method and protocol for cleaning the area so there’s a consistent level of cleanliness at all times. 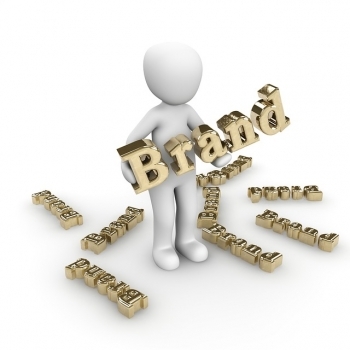 Cleaning plays a critical role in how customers view your brand. You don’t want them to see dirt when they walk into your facility, because it can mean they might not return. 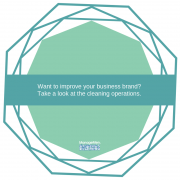 Cleaning for health is critical, but cleaning for appearance also matters as organizations look for ways to differentiate themselves from the competition. If you want to keep customers, make sure your building is clean and that first impression is a positive one.